We'll be adding all kinds of news and notes to this page. If you're looking for something specific, such as class or workshop information, try the Index or Blog Archive in the left margin. 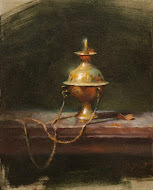 We're very honored that Charles has once again had a painting chosen as a finalist in the Oil Painters of America National Juried Exhibition of Traditional Oils! "The Links of Her Rubicon" will hang with the 235 other finalist paintings at the Illume Gallery of Fine Art in Saint George, Utah from May 10 - June 7, 2019. The entire exhibition is currently available to view online on both Illume Gallery's website and OPA's website. 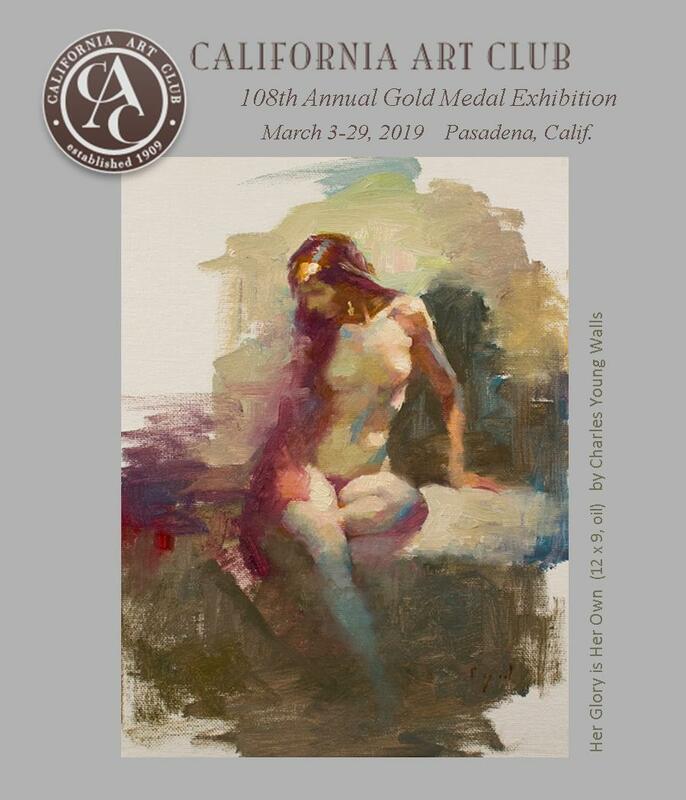 We have received the wonderful news that Charles has had two paintings accepted into the California Art Club's 108th Annual Gold Medal Exhibition! "The Silver Mask" and "Her Glory is Her Own" will hang in Pasadena from March 3-29, 2019. This is a tremendous honor, as he was just a few month ago accepted into full out-of-state artist membership with this prestigious organization. The California Art Club was built on the foundation of promoting and supporting contemporary-traditional fine art. As one of the oldest, largest and most active art organizations in the country, the CAC is committed to keeping traditional art alive. 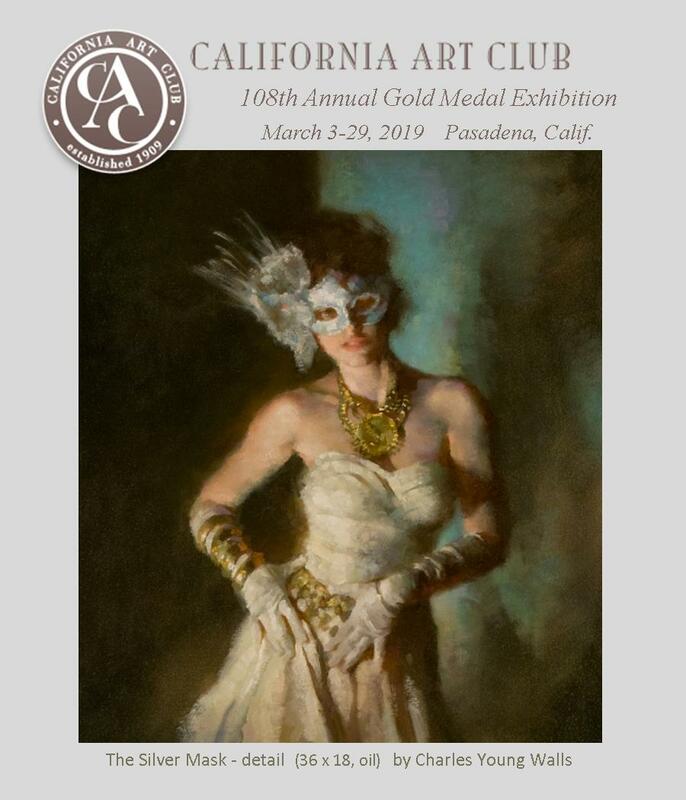 If you're not in Pasadena during the month of March, the 108th Gold Medal Exhibition is also available to view on the California Art Club's website. This beautiful little figure painting is headed to Fredericksburg, Texas! 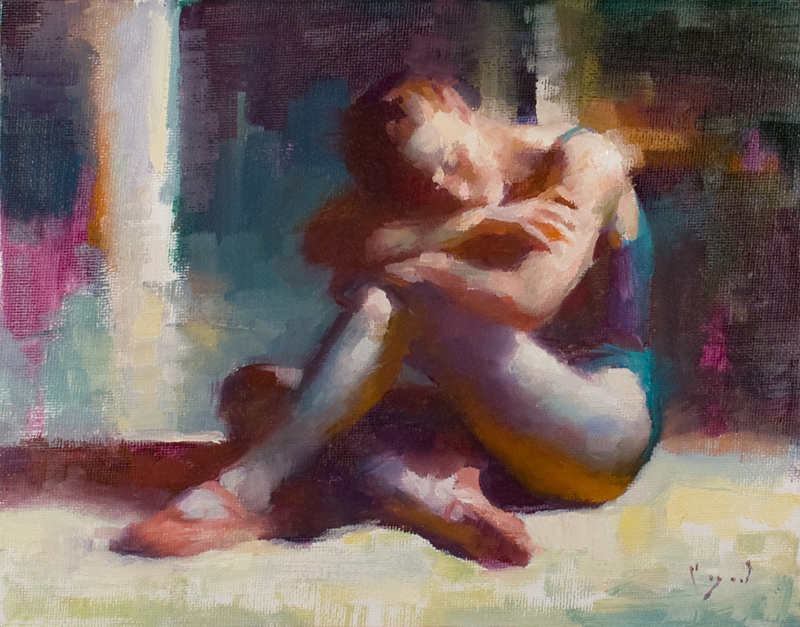 "A Moment's Rest" has been accepted into the National Oil and Acrylic Painters' Society's 2019 Best of America Small Painting National Juried Exhibition along with 125 other pieces measuring 16x20 or smaller from artists across the country. The exhibition opens March 1st at the RS Hanna Gallery in Fredericksburg, but until then you can view all the included paintings on the NOAPS website. Charles has recently been honored with an advanced membership level with two prestigious art organizations! 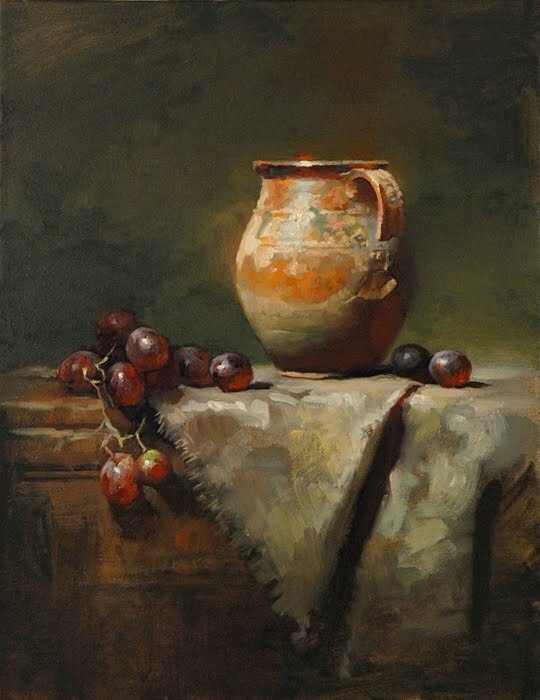 He is now a Signature Member of the American Impressionist Society after meeting their requirements of being juried into two National Exhibitions and two Small Works Exhibitions. During that time he also won a Second Place award for his painting "Amethyst." A much more formal jurying process with the California Art Club has resulted in Charles being named an Out of State Artist Member on their rolls. The jurying process is tough, involving the submission of multiple images, a bio, and a written statement, and the number of Out of State Artist Members in the organization is kept limited. Being named an Artist Member of the California Art Club now makes him eligible to submit to their Gold Medal Exhibition - the pinnacle of contemporary traditional fine art on the west coast. 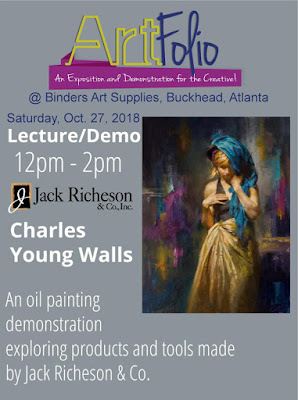 Every year Binders Art Supplies in Atlanta hosts the ArtFolio Expo, a gathering of art supply manufacturers and distributors who bring new products and specials to share with local attending artists and other creatives. 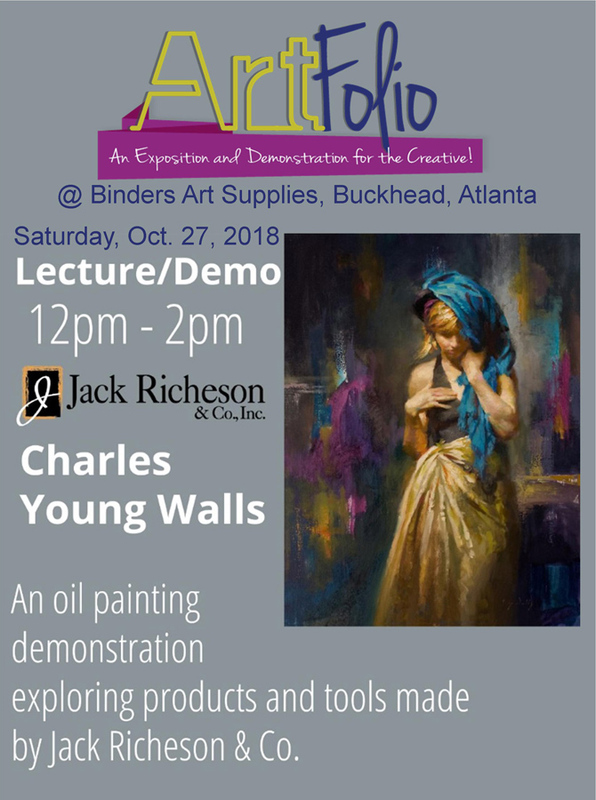 This year's event was Saturday, October 27th and Charles, in partnership with Jack Richeson & Co. Fine Art Materials, conducted a demonstration highlighting several of the Richeson products. After a little more than an hour of painting and talk, attendees were then invited to have "hands-on" time with Richeson's oil paints, brushes, and samples of their new mounted linen panels. More great news from Art Muse! 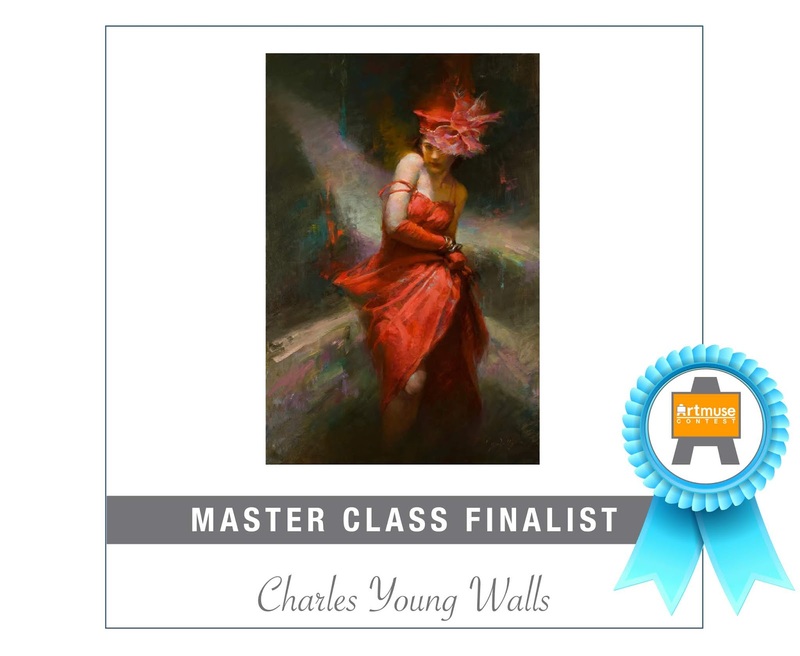 "She Beguiles in Red" was chosen as a finalist in the Master Class category of the September edition of the Art Muse Contest by that month's judge, the expressive figurative artist Chantel Barber. Many thanks to Chantel for her kind words, and to the Art Muse organizers! The temperature is dropping, the wind has changed, and dry leaves whisper ancient truths. 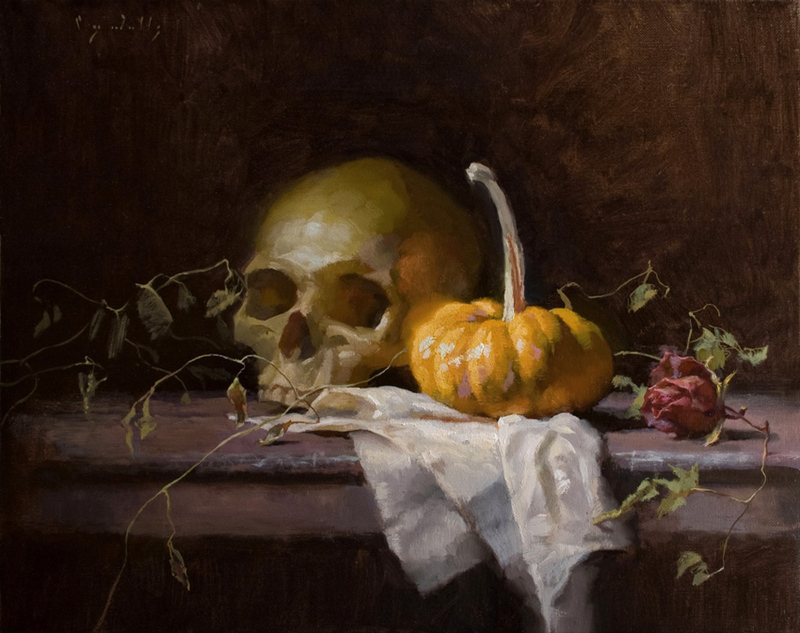 Charles' new still life painting that celebrates this time of year, "Season of the Waning Veil," will be on exhibit at McBride Gallery in Annapolis MD as part of the upcoming Oil Painters of America Eastern Regional Exhibition. The opening reception will be Sunday, October 28, just in time for Halloween, and the show will remain through November 25. The entire exhibition is currently available to view online on OPA's website. "The Silver Mask" wins Best Technique and Handling! 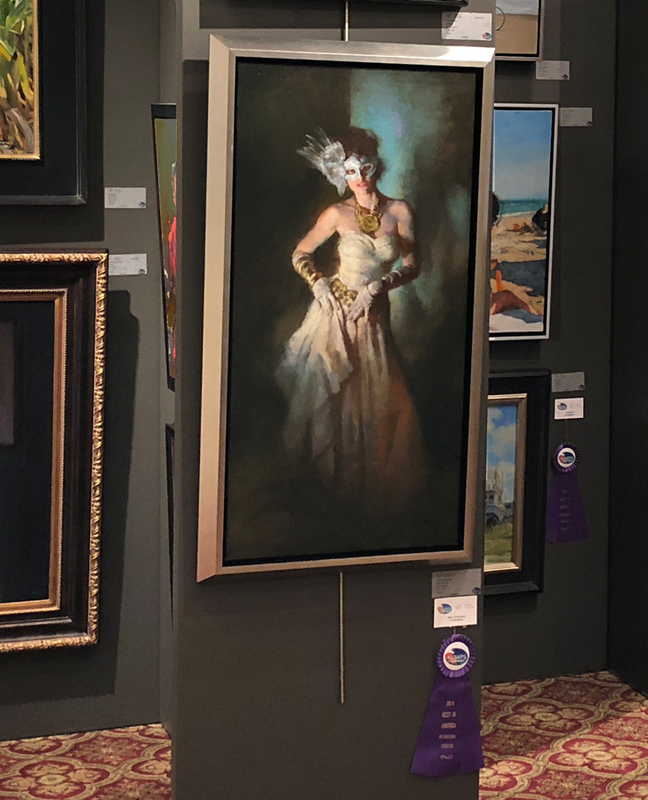 The National Oil and Acrylic Painters' Society's Best of America Exhibition opened on September 14th at Eisele Gallery of Fine Art in Cincinnati. We were very honored to hear that "The Silver Mask" was awarded Best Technique and Handling! Many thanks to awards judge Adam Clague for this honor and to Blue Ridge Oil Colors for sponsoring the award. The exhibition will hang through October 13th and is also available to view on the NOAPS website and the gallery's website. 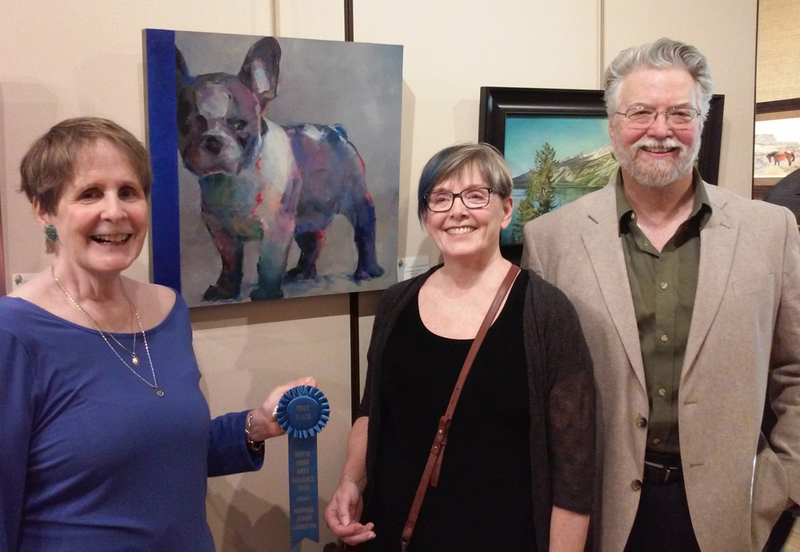 and First Place recipient NancyJanette Long with her painting "French Blue." This summer Charles was honored by two Atlanta-based arts organizations by being asked to serve as an exhibition juror and judge. 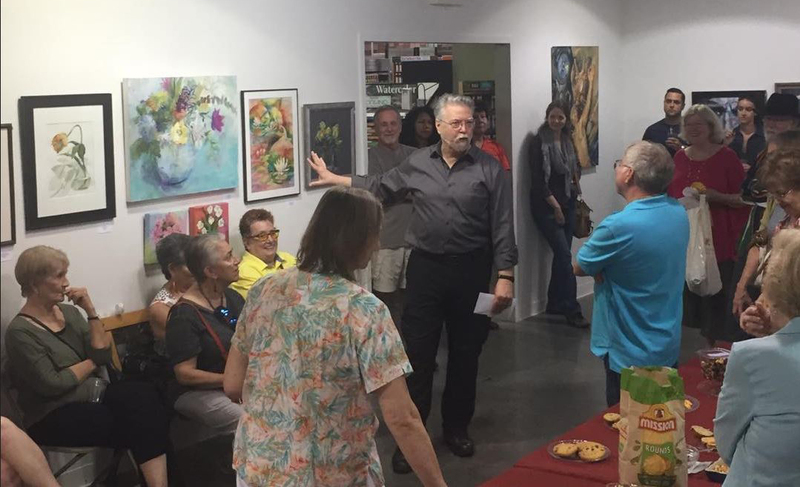 First, in June and July, was the Atlanta Artists Center's Limelight Exhibition, hosted by Binders Art Supply at their Limelight Gallery in Atlanta. Then, in July and August, was the South Cobb Arts Alliance's National Juried Exhibition, hosted by the Mable House Arts Center in Mableton, Georgia. For both, Charles completed the jurying process online where he culled down the entries and curated the groups of finalists. Awards for both exhibitions were then decided in person at the venues prior to the opening receptions. Choosing the awards for both was a many-hours-long and grueling process and Charles would like to thank the representatives of these groups for their organizational assistance. The awards presentations at the opening receptions were very informative. 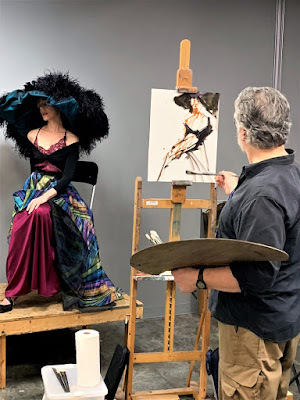 I always enjoy accompanying Charles to these because he always gives a short class about each award-winning piece - why it stood out, how it was successful in its concept and execution, and which artistic principle it exemplifies. I have heard from so many artists and non-artists alike that they really enjoy the explanations and elaborations instead of just a dry listing of names and titles. Presenting the awards at the AAC's Limelight Exhibition. We extend our congratulations to all the finalists and award winners of both the AAC Limelight show and the SCAA National Juried Exhibition! The SCAA Exhibition's opening reception got a very nice write up on the local news site The Cobb County Courier and the show was also listed as Number 1 in the "Top 5 Things To Do in Cobb County" list by the Marietta Daily Journal! 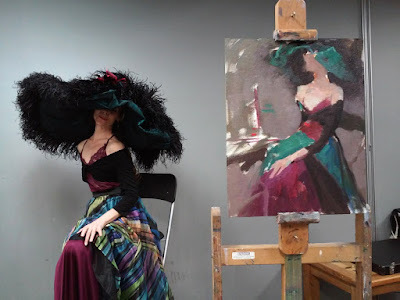 An award winning Atlanta area portrait painter and fine artist. Past copies of our newsletter are available in the Archives. Content copyright 2007-2019 Charles Young Walls. All rights reserved.